A new on-demand service that matches travelers with professional pilots and GA aircraft. Also, a turboprop with one third of the parts 3D printed, more on the American uncontained engine failure, recovery parachutes for larger aircraft, flexible airplane wings, Southwest pilots ratify a new contract, and enlisted pilots for remotely piloted aircraft. Rod Rakic co-founded OpenAirplane in 2013 to make renting an airplane as easy as renting a car. 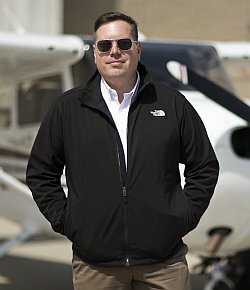 The “universal pilot checkout” resets the clock on the flight review, offers a renter’s insurance discount, and gives pilots access to the same make and model of aircraft across the U.S.
Now the company has launched FlyOtto, a new service that matches travelers with professional pilots and certified general aviation aircraft. On-demand private charter avoids the hassles of major commercial airports and increases the utilization of the GA fleet. FlyOtto takes advantage of the over 5,000 public use airports in the U.S.
A pioneer in the development of innovative experiences, Rod has spent 20 years creating online products that enhance and manage brands. In 2007, he co-founded myTransponder, a pioneering social media tool for aviation. Rod has years of experience developing tools and community specific to the aviation industry. Rod started flying when he was sixteen and holds an FAA commercial pilot certificate with an instrument rating. Follow @OpenAirplane, @FlyOtto, and @rodrakic on Twitter. Find FlyOtto on Facebook. General Electric has tested the a-CT7 demonstrator engine which incorporates a very high percentage of “3D printed” parts. In the Advanced Turboprop (ATP) engine to come, 12 printed parts are planned to replace 855 conventionally manufactured parts. The ATP will power the all-new Cessna Denali single-engine turboprop aircraft. In a preliminary report, investigators say the failed turbine disk that exploded on American Airlines Flight 383 showed evidence of an internal anomaly at the source of some fatigue cracking. Will a Large-Aircraft Parachute Recovery System Catch On? Aviation Safety Resources (ARS) is working on the TriChute Safe Landing system that could be used on larger aircraft, such as the 8,000-pound Cessna Caravan. When this system is activated, the fuel-laden wings separate from the fuselage, and all three portions of the aircraft descend under their own parachutes. Southwest Airlines says its pilots ratified a new collective bargaining agreement. The Southwest Airlines Pilots’ Association (SWAPA) says 84 percent of the pilots who voted were in favor of the new contract. SWAPA announced the deal means a 15 percent pay raise, with a 3 percent annual increase through 2020. Also, pilots are no longer required to contribute to the pension plan. The U.S. Air Force has an initiative to train enlisted Remotely Piloted Aircraft (RPA) pilots for RQ-4 Global Hawk missions. The October 12 Enlisted Pilot Initial Class (EPIC) included four enlisted students along with twenty commissioned officers. David asks for your help to decide which aviation book to review next. Review Que: I need your help. FAA Safety Briefing November/December 2016 (PDF), Why Can’t I Uber with my Airplane? This entry was posted in Episodes and tagged Air charter, American Airlines, FlyOtto, GE Aviation, parachute, Southwest, USAF on November 9, 2016 by maxflight.